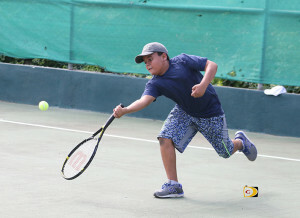 Tennis consultant Mike Burrell said things have been really positive, following the final phase of the BVI Tennis Association 2016 project concluded with a Jr. Tennis Development Tournament on Saturday, at the Long Look Public Courts. Leading up to the weekend tournament, a play day was held on Thursday and Burrell said he was quite surprised by the turnout. The tournament targeted U10, U12 and U14 players. Regarding the three phases of the tournament Burrell who has conducted similar programs all over the world, said that in the 10 and Under, there was a balance and kids who had never played before. He said five-six played really well and he was impressed by some of the things that they could do, but, there’s still lots of work to do. “There’s good promise and clearly, a lot of people have actually spent quite a lot of time on the tennis court practicing, in order to get ready for the tournament.” he noted. He said he saw much of the same with the 12 and Under as in the 10 and Under, but in some ways the 10 and Under development has been early, some of them have shown more promise than the 12 and Under. He added that they are stronger in the younger ages because the program is a little bit more mature. In assessing the program since May, Burrell said it has been ‘up and down.’ He said there have been some challenges and they have had to learn about the way people see things in the BVI around the perception of the sport and the way they have had to work with the different providers which he described as ‘interesting one for everybody’ as everyone has been in their little bubble and not coming together and doing things.